My daughter wanted a simple and light bike rack for the back of her Audi TT and we looked everywhere for something that might fit. Tried loads of forums and all the main online retailers, who all said it couldn’t be done. Well I beg to differ – this is is cheap, feels very solid and she finds it really easy to hook up. Available from Wiggle here. Engineering talk – not for the faint hearted..
Found this section of the Mavic site when I was registering for a chance to win a ride in the lead Mavic car on the Paris-Roubaix. How utterly fab would that be…. By way of a balance to my previous post, I thought it appropriate to mention that there are some truly amazing retailers online. 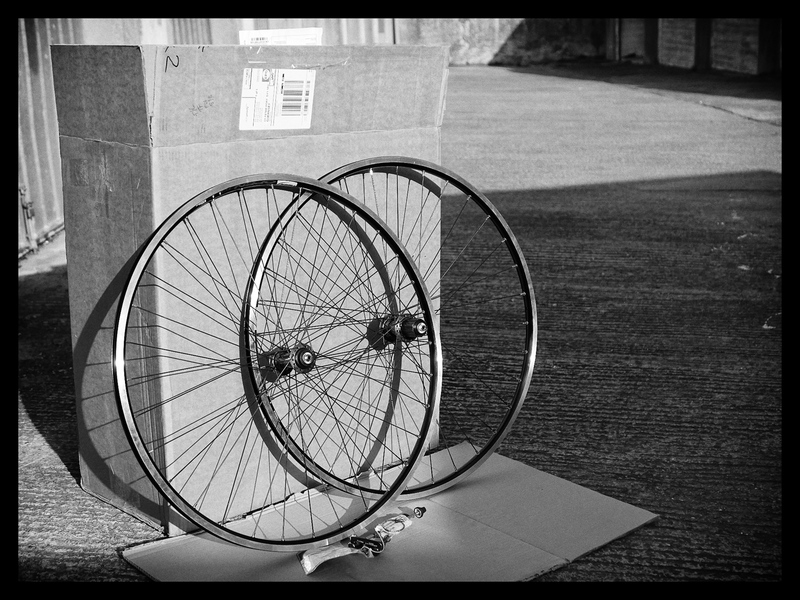 Yes, I should have done my homework before attempting the ‘Hindegate‘ debacle and having learnt my lesson (and now being in possession of my money) I duly began the search for a decent, respectable supplier of handbuilt wheels. 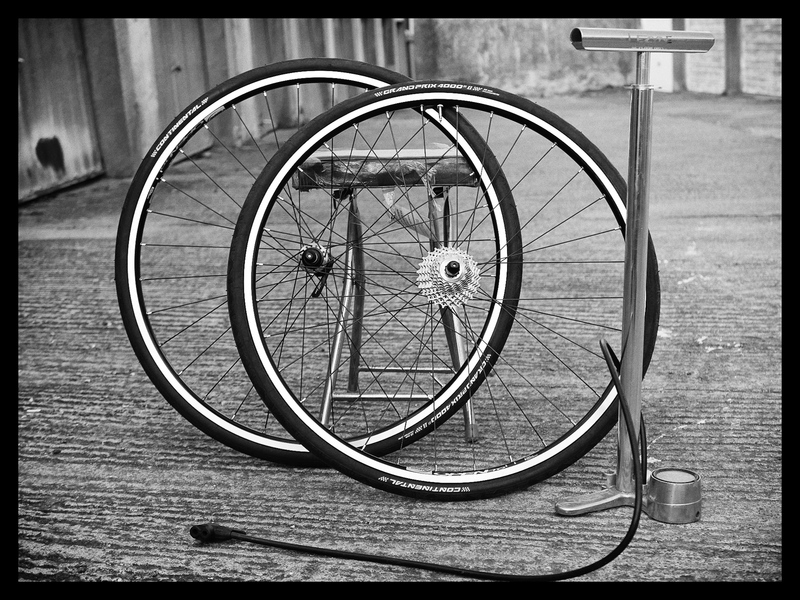 I’d always had pretty good experiences dealing with Merlin Cycles but was completely unaware that they offered a custom wheel building services until I read a few reviews and did a bit of digging around their website (it’s not immediately obvious). These guys have a great reputation, the wheels were a competitive price, and I was informed that it was likely to take around 8 days for such a service (hell I’d waited three months for the other guys and seriously considered contacting Matt Allwright at Rogue Traders). I duly paid with Paypal (a bit of extra protection) and held my breath. For just five days. 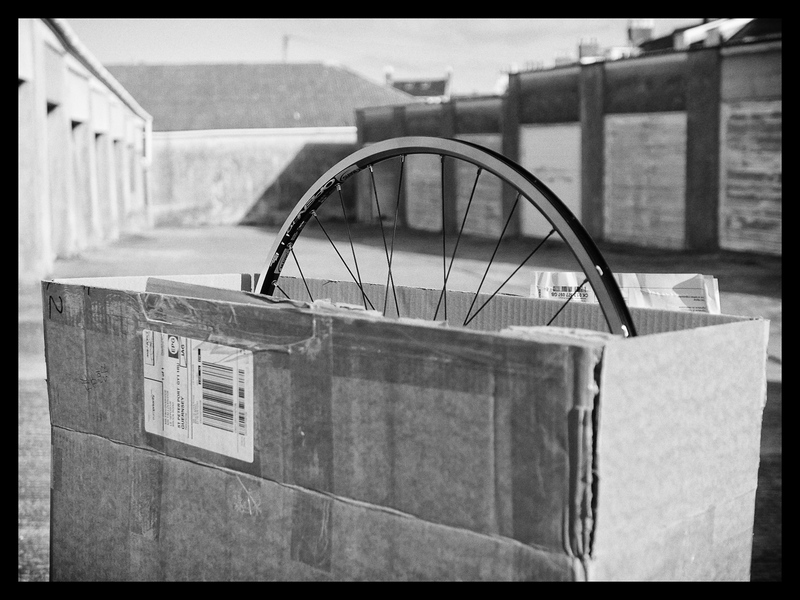 I picked up my fabulous new hoops from the posty on Thursday and have to say that they’re just what I was after – Ultegra hubs, 32 spokes and Mavic Open Pro hubs. 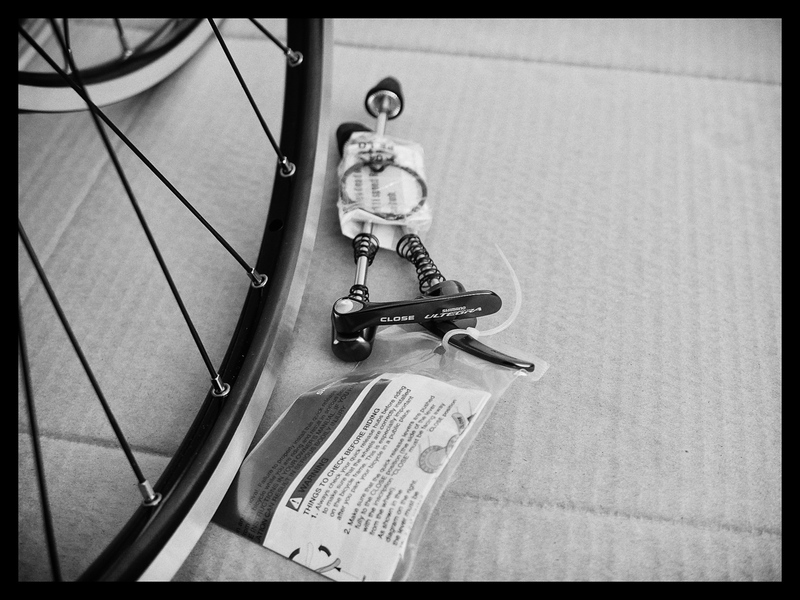 Easy to service, reliable and perfect for winter cycling. A huge thanks to Merlin for restoring my faith. Highly, highly recommended. The worst bike shop ever? During October 2014, I became increasingly aware that the bearings in my Mavic rear hub were really on the way out (too many winters) and, being of the cartridge type, adjustment wasn’t as straightforward as the standard cup&cone variety. 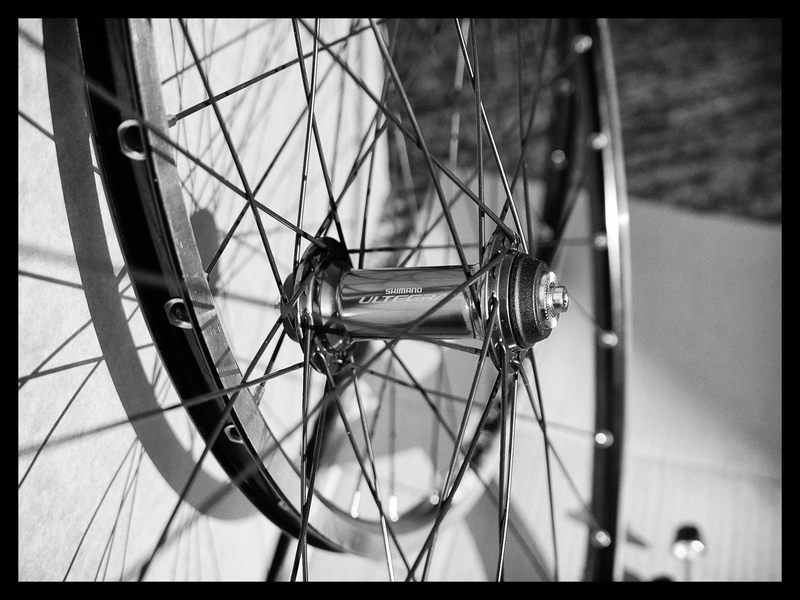 I hankered after a pair of traditional handbuilt wheels – Ultegra hubs, 32(ish) spokes, Mavic Open Pro hubs. After a bit of searching (admittedly not too much – more of that later), I came across David Hinde Racing. The spec was good and after an initial email enquiry, I received a response from the company suggesting I call them to confirm the order and sort out the shipping, which is quite normal when seeking delivery to Guernsey. Since then this company ‘David Hinde dot com’ (no I won’t put up a link – but if you’re interested, google the reviews. I wish I had.) have bluntly been the absolute worst, appalling and rude retailer I’ve ever had the misfortune to be involved with. Repeated emails, various phone calls, advice from Trading Standards, Consumer Protection and Citizens Advice, a variety of attempts to reach an amicable conclusion (refund? – nope, wheels? – nothing, apology? – kidding) have got me absolutely nowhere. I finally contacted my Credit Card company, and went through the process of putting in a claim in the hope of getting my money back. Today I got a letter from Marbles confirming that they had indeed refunded my account – so a big thanks to them and no thanks whatsoever to Dave Hinde and his mob. This is a rare occurrence – the vast majority of online retailers are brilliant, and even the not-so-good ones can usually be relied on to have at least a modicum of integrity. This company doesn’t. And I think you all should know. The final year of the Defender? OK so it’s not cycling and it’s not about photography, but hey it’s my blog and 2015 is set to be a significant year for Land Rover with the demise of the iconic Defender. I’d always wanted one of these vehicles for no other reason than I think they look fantastic and hark back to a bygone era (glory days?). How many other vehicles can you say have remained largely unchanged for 67 years? So in May 2014 I took delivery of a Defender 90SX and literally from the second day of ownership I’ve been ‘personalising’ it – essentially treating my landy as a great big Meccano kit. It’s certainly not without it’s flaws (you’d think after 67 years, they would have ironed out all of the wrinkles), but it is absolutely full of character and a lot of fun. I have to also add that the devoted community are a fab bunch of guys and girls, who are really open minded about why we own these things – some live on the farm, some spend their life in Chelsea – but they are all quite unique to their owners. Now I’m a self confessed lover of technology, but there really is something very calming about a vehicle that doesn’t bing at you to do up your seatbelt (since when did we think it was OK to be patronised by our car?). And I love the fact that I could (and in fact did) change the steering wheel. These things will continue to be handbuilt in small volume (around 15,000 per annum) at the Solihull factory (“a place where vehicles are given their souls”) until the middle of December, with various ‘special editions’ appearing as a swansong. If you hanker after a new one, you’d better hurry. A friend of mine has the older Series 3 and a softop classic would be just perfect for the summer, but I think the wife will take some convincing. Next post will be back to the main theme of this site, but don’t be too surprised if I lace a little landy conversation into the mix. 2014 was a very busy year for a variety of reasons – photography trips to Paris, time spent in Tuscany, more time visiting new towns in the UK, buying a new car (a Meccano kit really), spending way too much time working and a bit of unexpected time in hospital. All of this meant I neglected both my blog and, to some extent, photography. The cycling was always here but not the the same extent as I would have chosen. And so to the better… on The worst bike shop ever?